InLoox PM is unable to show emails in the document preview. If that’s the case it is very likely that the reference to the proper „Preview-Handler“ in the Microsoft Registry is missing. 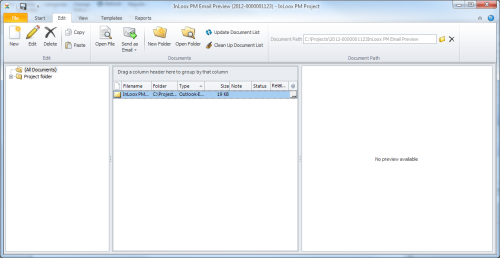 Please note that the document preview in InLoox PM is supported not before Microsoft Vista. Download the proper registry from the following link and import it in the registry of the affected computer. Email preview is not available in InLoox PM 7 - InLoox • Copyright 1999-2019 © InLoox, Inc. All rights reserved.